Eight page PDF download includes crochet pattern with several photos to help you. 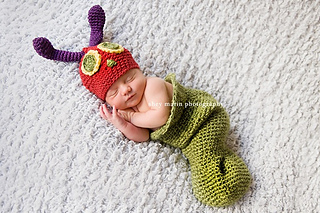 This Caterpillar hat and cocoon crochet pattern set makes for adorable first photo sessions for boys and girls! So whimsical and sweet, these photos will make a cherished keepsake for years to come. You will receive a PDF file with crochet pattern instructions for the cozy cocoon, designed to enclose baby from the chest to the toes. Crochet hat instructions include the pattern for the newborn hat, eyes, nose, and antennae, including tips for making the antennae stand up straight, not flop down. This beginning skill level pattern is written for worsted to chunky weight yarn using I and H crochet hooks. Any crochet stitches beyond the basics are fully explained in the pattern.